A rebreather is one of the most impressive pieces of gear you will ever invest in for diving. I mean come on, these things allow you to swim with the fishes and live to tell the tale. And who wouldn’t want to take a walk on the ocean bottom for a couple of hours? There is nothing like the freedom to explore the ocean that a top of the line rebreather allows us. Once you try a rebreather, there is no going back. So, say goodbye to snorkeling and hello to diving. Choosing the best rebreather can be quite the task, especially for those with no previous experience diving. There is a lot to consider, and when it comes to your safety, there is no room for mistakes. A rebreather is a piece of standard equipment used by divers all over the world. In short, it is a mechanized recycling system that takes the breath exhaled by underwater divers and removes the carbon dioxide from it. After the equipment eliminates the carbon dioxide, fresh oxygen is added in its place, allowing for the rebreathing of otherwise used up air. Now that we’ve covered what a diving rebreather is, here are some of the most frequently asked questions about them. How long can I stay underwater using a diving rebreather? Depending on the make and model, a diver using a rebreather can typically stay fully submerged for anywhere from one to six hours. How deep can I dive with a rebreather? The depth that you can dive with a rebreather is affected not only by the type of rebreather you’re using, but also by the kind of water, temperature of water, and other variables. 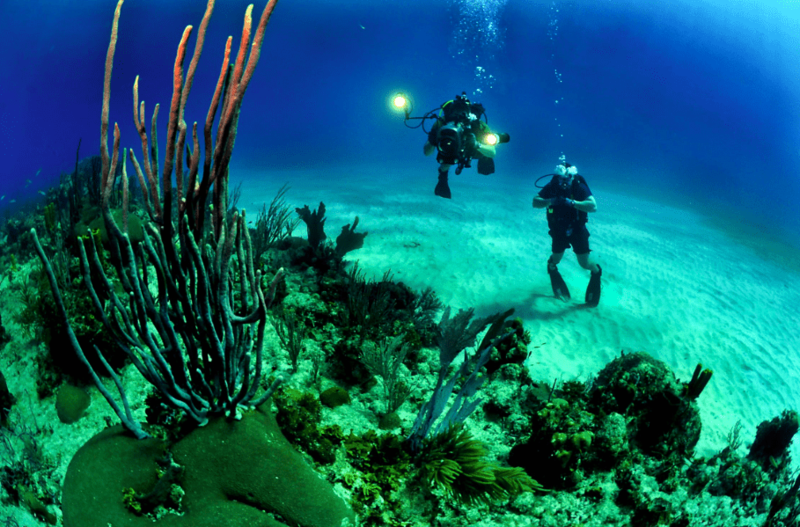 Typically, recreational rebreathers work within a range of 40 to 130 feet. However, some high-end rebreathers will allow for diving up to nearly a 1,000 feet. What are the risks of diving with a rebreather? There are several potentially dangerous risks involved with diving and using rebreathers. Some of those risks include hypoxia, low fractions of oxygen in the mix, or running out of oxygen in general, inadequate purging of breathing bags, and the general malfunction of equipment parts. How much training do I need before diving with a rebreather? Rebreather training can last anywhere from hours to days and cost anywhere from $200 to over $1,000. During this time you will learn how to properly use the equipment, gain a deeper understanding of diving in general, as well as learn how to cope with the stress of being completely submerged in the ocean. If you plan on diving in more than one location around the world, you’re going to need a rebreather that can either be checked in as luggage or carried onto airplanes. What's the size and weight? The size and weight of a rebreather are crucial aspects to consider. Such factors as these will affect the overall comfort level of your dive almost more than anything else. How easy is it to build and break down? An often overlooked consideration to make before purchasing a rebreather is the ease of building and breaking down that it allows. These factors are going to be very important as they determine whether you need minutes, or hours, to prepare your equipment before and after each dive. What will it cost in annual upkeep? Probably the most overlooked aspect of all is the annual upkeep. Rebreathers not only cost a pretty penny to purchase, but they also take a lot of money to keep maintained. Repairs, refills, and upgrades are not cheap. Make sure to consider this when choosing one. Maybe you’re planning a vacation to the Bahamas or Hawaii soon and would like to find the best rebreather for diving. I’m going to let you know up front; it’s going to cost you a pretty penny no matter which one you buy. Rebreathers cost between a couple of thousands of dollars to tens of thousands of dollars. Due to the high price of rebreathers, it’s imperative to learn as much as possible about them before making a purchase, unless you can afford to shell out a few thousand dollars on a whim. To bring you the most vital information available on rebreathers, we turned the internet upside down and shook it out. What we ended up with was ten of the best rebreathers available for purchasing online in 2018. Once we gathered our list of rebreathers, we conducted the majority of our research based on in-depth customer reviews, product descriptions from the most trusted manufacturers in the industry, informational and marketing videos and more. We compared the quality of components used in each product, over-all ease of use, dive time capabilities, maintenance factors and several other critical aspects of rebreathers. Without any further ado, here’s the list you’ve been waiting for; the top rebreathers of 2018 in no particular order. The Sentinel Redhead CCR, designed with deep ocean exploring in mind, has an easy to use over the shoulder counter lung and an extended three-hour scrubber duration. Newbs can quickly master the unit, and it has one-of-a-kind aesthetics as well. The most significant feature of the Sentinel compared to other rebreathers is the unique C02 detection system and a LED display. On the other hand, it’s main con is that it is heavy and is not ideal for traveling. Find out the most current price and warrant option on VMS Rebreathers. Built with technical divers in mind, the JJ CCR is an excellent choice for those who spend long periods of time under the water. This unit has an amazingly simple yet effective layout. The scrubber duration lasts three hours, and the counter lung conveniently rests on a back mount. One of the best things about the JJ CCR is that it is so easy to use. On the other hand, it is also larger and heavier than many CCRs in the same class. Find out the most current price and warranty options on JJ CCR. The Inspiration Evo CCR from AP Diving is another ideal rebreather for traveling. It's sleek design suits divers with small frames the best. It has an on the shoulder counter lung and a scrubber duration time of two hours. When purchasing this unit new, you have the option to customize specs to fit your diving profile even better. The main pro of the INSPIRATION EVO is that it is perfect for traveling. The main con is that it doesn’t work well for longer dives as the scrubber duration is only a couple of hours max. Find out the most current price and warranty option on AP Diving. The Prism 2 CCR from Hollis can reach depths of up to well over 300 feet, making it one of the deepest diving units on our list. The radial counter lung rests on a back mount, and the scrubber duration lasts between two and three hours. This unit rebreather comes completely ready to dive straight out of the box. The main pros of this unit are that it can be controlled electronically as well as manually for a more personalized approach to diving. The main drawback is it is incredibly high priced. Find out the most current price and warranty option on Hollis Rebreathers. The POSEIDON SE7EN rebreather is an excellent investment for recreational divers. The scrubber duration is three hours long, allowing an extended dive time. Counter lung location is over the shoulder. The unit itself is super lightweight for a rebreather and is excellent for traveling to exotic dive locations. The main advantage to this rebreather, other than its lightweight mobile design, is that it is upgradeable for technical diving. The downside, however, is that the upgrade is highly expensive. Find out the most current price and warranty options on Poseidon. The Inspiration EVP CCR from AP Diving is easily one of the best all-around recreational rebreathers of 2018. It works well for most any dive profile and comes in an easily manageable size. You won’t have any problems taking it along on travels. This unit’s counter lung location is over the shoulder. Also, the scrubber duration is three hours, so you have plenty of time to enjoy each dive. One of the best things about this rebreather is that AP allows the customization of specs with each order. The main drawback to this model is the not so appealing aesthetics. Find out the most current price and warranty options on AP Diving. The KISS EXPLORER CCR is designed with those who prefer complete control over their diving units. The scrubber duration lasts two hours long, and the counter lung location is on the back. The EXPLORER is perhaps the safest rebreather featured on our list. The main pro of this unit is the added safety feature of a manual closed-circuit rebreather. The downsides are the short scrubber duration as well as the hard to access counter lung. Find out the most current price and warranty option on Kiss Rebreathers. Built for long, more in-depth than usual, technical dives, the Meg, as it is nicknamed, is the flagship CCR model produced by ISC. It is excellent for most extended dives. The unit has an over the shoulder counter lung location as well as a long-lasting three-hour scrubber duration. The most positive aspects of the Meg are its highly durable construction and that it comes with two independent handsets. The main drawback to the Meg is that it is a more awkward diver than many CCRs in the same class. Find out the most current price and warrant options on Innerspace Systems Corp. The rEvo III CCR is another versatile rebreather that works well for just about any sort of diving you can imagine. It primarily works well for cave diving due to its sleek, compact construction. It has a back mounted counter lung and a three-hour scrubber duration for taking longer dives. The most significant benefits of the rEvo III is the unique design of the scrubber, built with the safety of divers in mind, as well as the overall slim design of the unit. The main drawback, however, is that its all-metal frame requires particular attention and extra upkeep to maintain. Find out the most current price and warranty options on Revo Rebreathers. The Orca Spirit CCR from KISS is one of the most unique rebreathers to make our list. Unlike other CCRs with double oxygen cylinders, this one has a single onboard oxygen cylinder mounted on the bottom of the unit. It is also far slimmer than other rebreathers and ideal for all sorts of dives. The counter lung is on a back mount, and the scrubber duration is between two and three and a half hours long. The most significant advantage of this rebreather is the one-of-a-kind dual scrubber with its longer than average lasting duration. It also has an affordable price and is excellent for traveling. The main con is that its counter lungs are hard to access during the dive. The number one rebreather of 2019 is AP Diving’s Inspiration EVP CCR. This bad boy is great in any type water for any size diver. It’s not too big, and it’s not too small, so it’s the perfect unit for taking on trips. I guess you could say it’s the Goldilocks of modern rebreathers. Dive time is right around three hours which is plenty of time to get around under the waves and explore as much as you want to. Also, one of the most excellent benefits of this particular rebreather is that it is fully customizable. We’d love to hear from you if you’ve purchased a rebreather for diving in 2019. Was it one of the items on our list? If not, where did you find it and how did it work out for you?